Halal certifiers in Australia have offered tens of thousands of dollars to Indonesia’s top halal authority — the Majelis Ulama Indonesia (MUI) — in apparent attempts to ensure greater access to the lucrative Indonesian market. Former president of the Australian Federation of Islamic Councils (AFIC) Ikebal Patel told Four Corners MUI officials had to be kept happy if Australian halal certifiers wanted to be granted the right to certify exports to Indonesia. “Around the world if you wanted to get certification rights for Indonesia, you had to do what it takes, and when I was the president, I wasn’t prepared to do that,” he said. The MUI said it did not charge fees for access to the Indonesian market. But in 2011, while Mr Patel was AFIC president, he wrote to the MUI offering $10,000 along with a 70:30 split of the profits, in exchange for halal certification rights. “We made it very clear that this money was to go to MUI, but not to individuals and that is something that I was very, very clear about,” he said. Mr Patel ceased to be AFIC president in 2012. In 2013, AFIC attempted to give the MUI $20,000 as a donation towards the construction of a new office, but after sending a cheque to MUI the payment was refused. AFIC spokesman Amjad Mehboob has denied it was an attempt to gain more access to Indonesia’s halal certified market. “One might think that it … it may have some links with halal, it may have been … it was not put that way … people can make something out of it,” he said. 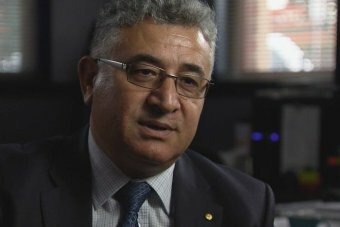 Australian halal certifiers say profits earned in Australia are channelled back into Muslim communities to help them run schools and fund mosques. “When I talk about [the Islamic Coordinating Council of Victoria] ICCV in particular, that money’s spent in Australia for Australians,” ICCV deputy chairman Ekrem Ozyurek said. But Four Corners has confirmed the ICCV’s profits from halal certification in Australia are also travelling to Indonesia to help build a sprawling $5 million development controlled by a senior MUI official. 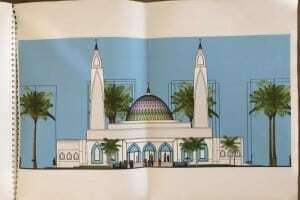 The development 60 kilometres south of Jakarta has commenced construction and includes a large mosque, an orphanage and a school. The ICCV has a virtual monopoly over the halal certification of red meat exported from Victoria to Indonesia. The ICCV is also the sole representative of the MUI in Australia. Mr Ozyurek has confirmed his organisation is contributing to the five-hectare development in Jonggol, West Java, but did not detail how much. “It’s going for the purpose of [an] orphanage or something they are building and they need that money to build that orphanage or a mosque, that kind of a thing … there’s a possibility that some money might be given to them, yes,” he said. Four Corners has learnt MUI halal chairman Amidhan Shaberah heads an unregistered private foundation, titled The Good Deeds for the Hereafter Movement, which is building the mosque project. Anti-halal campaigners in Australia characterise halal certification as a religious tax because meat processors and food companies pay fees to certify products which are bought and consumed not just by Muslims, but by most Australians. Halal is the Arabic word for “permissible” and defines food which is acceptable for Muslims to eat. In simple terms, this means that halal certification is a guarantee that forbidden items, such as pork and alcohol, are avoided by meat processors and food manufacturers. Most Australians are eating food that has been halal certified, as manufacturers seek certification to improve export sales. As an example, at least 80 per cent of chicken meat processed in Australia comes from halal-certified plants, but currently less than 5 per cent of that meat is exported. That is because it is very difficult to disentangle certified products from an entire supply chain, Asia business consultant Danny Burrows said. “That is far more costly than to just say, ‘let’s do the whole thing’ and that I think is the reason most producers will tell you we just get the whole thing certified,” he said. The costs of halal certification vary widely. One of Australia’s largest red meat processors, JBS Australia Pty Ltd, paid $2.4 million for halal certification in 2014. The cost of halal certifying all Vegemite production is about $10,000 a year, while less than $20,000 covers the certification of more than 70 Cadbury confectionary products. Australian Food and Grocery Council chief executive Gary Dawson said the impact on consumers was minimal. “Halal certification across processed, packaged food really makes very little or absolutely no difference to the product, the processing of it or the price … that the consumers pay,” he said. Madura Tea used to pay $1,400 a year for halal certification and calculates this as costing a tea drinker 1 cent per year if they drank 400 cups of tea each day for 12 months. Even that cost is too much for anti-halal certification campaigners like Kirralie Smith who runs the website Halal Choices. “It’s a religious fee. The money at the end of the day, whether 1 cent from my pocket, but collectively it’s $1,000, $2,000, $10,000, $27,000,” she said.